What is the name of a fish that can live almost as long as an average human does and is known for defending its territory as a dog would do it? This is a story of a senior citizen of the ocean, Vermilion rockfish, popularly called simply “reds”. Besides the name Vermilion rockfish, they are commonly known as vermilion seaperch, red snapper, and red rock cod, and are classified under the Latin name Sebastes miniatus. They belong to the family of Scorpaenidae (Scorpionfishes) and are related to Lionfish and Tropical Stonefish . It can be found in the Northern Pacific, from Alaska to Baja California. Divers love to meet them because they like to sit motionless in kelp beds or to hover over the rocky reefs, so one can get great photos. They are also very curious and are known to approach divers. 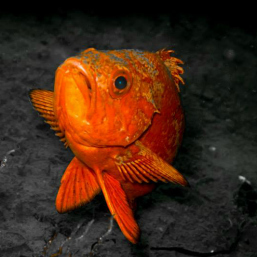 They are one of the largest rockfish; the body of the adult Vermilion can grow up to 30 inches and can weigh up to 15 lbs. They are usually bright red, while many of them have black and gray patterns on back and sides. The fins are usually darker at the end. Their mouths are big with protruded and rough lower jaw so they can practically inhale their entire pray easily. Eyes are also big and the body is compressed. When in deep waters, they are sometimes confused with Yelloweye and Canary rockfish, but these fish have lower jaws with no scales and are, therefore, smooth to touch. Generally speaking, they can be seen in areas over rocky bottoms and at depths most commonly between 100-500 feet. Their signature is “motionless movement” thanks to their air bladders. They allow them to sneak up to the pray with almost no fin movement. They are predatory fish and tend to feed on crabs, squids, octopuses, other smaller fishes, even other rockfish. Fertilization is internal (Ovoviviparous), and they give birth to living young. Spawning occurs from September to December peaking in November. They are much sought after both in commercial and recreational fishing and because of their behavior, slow grow rate and territorial habits they are overfished in many areas. Since they mature late and grow slowly they are often caught before they got a chance for reproduction which can be a problem. That is why there are certain conservation methods regarding season, hooks and depth, but they vary from bay to bay. However, their IUCN Red List Status is still “Not Evaluated”.